According to “Alternative Cures: More than 1,000 of the Most Effective Natural Home Remedies”, potatoes can be used for treating skin acne and acne scars. Raw potatoes help with many skin problems. They not only clear the facial skin by cleansing the excess oil, but also help control and prevent acne, pimples, blackheads and whiteheads. 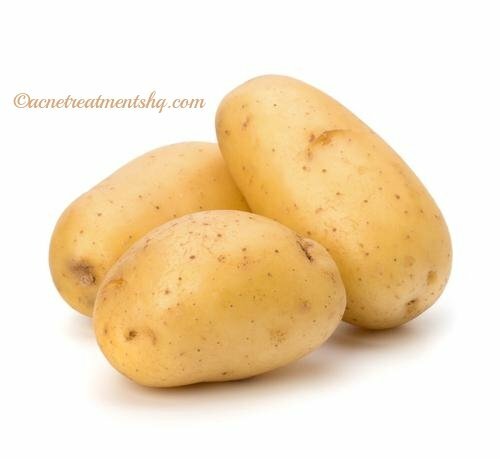 Why Potatoes Clear Skin Acne? Potatoes are chockfull of vitamin C, which is known for its abilities to boost collagen production and helps prevent and heal damage from the sun, stress and environment. They are also rich in vitamin B, which is good for healthy DNA production, skin cell regeneration and it actually penetrates the epidermis rather than sitting on top. Moreover, potatoes provide niacin that can lighten hyper-pigmentation from acne or other skin conditions. All-in-all – raw potato not only works as a skin acne remedy, but also helps remove hyper-pigmentation, brighten the skin and prevent wrinkles. (i) Wash and dry a potato. Take half potato and grate it. (iii) Take a piece of cotton wool and dab it into the juice and rub it all over the acne and dark marks (hyperpigmentation). Do it up to 4-5 times a day. Within 2 weeks, you will notice remarkable improvement – your dark marks will lighten and and the pimples will reduce to a great extent. It really works! Continue with this remedy to completely cure your acne. Here is a home remedy to clear away acne, improve overall complexion, and make your skin look smoother & softer. (i) Take a medium size potato, wash and dry it. (ii) Grate the potato and squeeze out its juice. (iii) Soak a piece of face-mask paper in the juice, and then put the potato-juice mask on for 20 minutes or so until it dries up. (iv) You can apply this natural remedy every night before you sleep. You don’t have to use any lotion or cream after it. Here is a diy remedy to stop new acne, kill the active ones, fade out the scars, and brighten your skin color. (i) Blend together potatoes and apple cider vinegar and pour into ice tray and put in the freezer until frozen. (ii) Cleanse your face and grab a frozen potato cube and rub it all over your face, leave on for three minutes and then rinse. You will see result in a week. Your skin will look so dewy and clear that you will fall in love with potato cubes, lol. A super cheap remedy to fade out your acne scars! (i) Take a potato, wash it and cut in half. (ii) Using a peeler, cut thin slices and apply them directly on your face. (iii) Leave them on for 20 minutes; they will start to get dry. Remove and repeat. (iv) Apply this remedy every night for 1 hour (20 minutes intervals x 3 times). Not only this remedy helps fade the dark spots and acne scars, it actually helps reduce the acne from becoming red and inflamed as well. An effective alternative to Retin A (1%), Vitamin C serum and Glycolic acid. Caution: Some people’s skin is allergic to potato. So if your skin experience some reaction then I suggest you wash your face immediately and apply baby powder all over where you applied the potato juice. Previous articleHow To Get Rid Of Body Acne Fast?